You can pay by bringing a check to the church office during normal business hours or to The WRECK on Wednesday Nights. 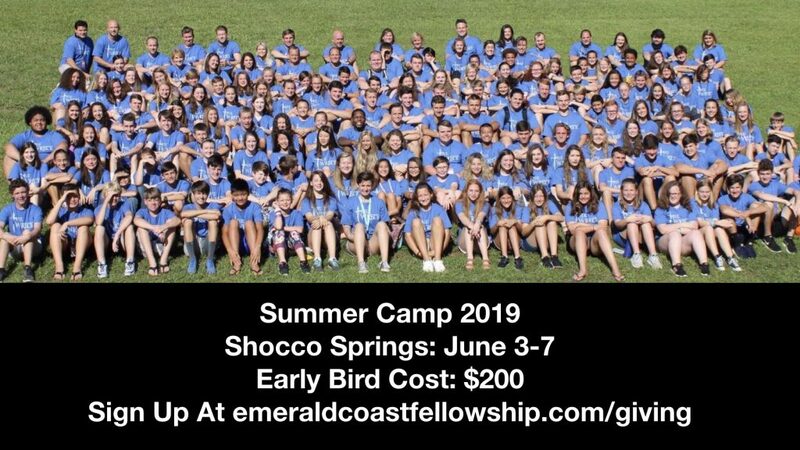 You can also pay online by going to www.emeraldcoastfellowship.com/giving. If you pay by check, please make the check out to Emerald Coast Fellowship. In the memo line please put your students first and last name and summer camp. If you chose to pay online please click on “youth summer camp” on the dropdown menu and in the memo line please put your students first and last name. Also, please provide an email address. Once you pay, you are registered for camp. In April we will mail out the paperwork that a parent will need to fill out and return to the church office. We will provide this date in the packet. Shocco Springs in a conference center that is owned and managed by The Alabama Baptist Convention. It is a top notch facility that our students request to keep going back to each year. Their website is http://www.shocco.org. The camp we are attending is put on by a company called Student Life. This is one of the largest Christian camp companies in the world. They are know for providing excellent worship leaders and speakers for their events. Their website is https://www.studentlife.com. This years camp speaker is Landon Dowden and the worship leader is Bethany Barr Phillips.